How Many Men Can Be True to One Meat? Think the Brits are stuffy? You don't know the half of it. 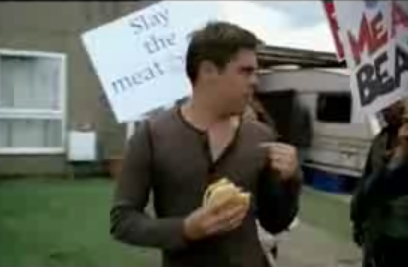 See a bunch of disgruntled British housewives protest against a man accused of "polygameat" -- the practice of eating more than one meat in a burger. By Crispin Porter + Bogusky for Burger King's Meat Beast Whopper. Sorta reminds me of that meatatarian thing Wendy's is promoting. Ohmigosh. Is flesh-eating finally cool again? Because I could use some gazelle, garnished with pepperoni and a side of fried chicken strips. Dipped in lamb's blood.